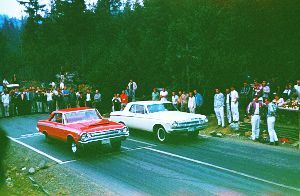 If you have any old school hot rod photos from Vancouver Island you would like to contribute, please contact us. 1974 Mayfair Shopping Mall car show in Victoria. A PDF Document detailing the history of the Quarter Milers club out of Victoria BC. Some more Classic Pictures added from Dennis. Special thanks to Dennis for supplying these pics from back in the day.